Professor Raisa Deber of the Institute of Health Policy, Management and Evaluation has been elected as one of 89 new Fellows to the Royal Society of Canada (RSC). It is one of the highest honours an individual can achieve in the Arts, Social Sciences and Sciences. Deber, who has been elected to the Division of Social Science, joins a distinguished group of over 2000 scholars from across the country who have been recognized for their remarkable contributions to public life. Deber’s work has had a direct influence on policy, and her ability to provide the best data and evidence to keep policy makers and the public well informed is something she considers one of her biggest accomplishments. An example of this approach can be found in Deber’s integral work with colleagues from Manitoba on financing models of health care, in particular medical savings accounts (MSA’s). As Deber explains it, this model of financing health care – used in some countries such as the United States – is derived from the economic theory that individuals will be more efficient purchasers of health resources if they must pay for it themselves. “My reports on MSA’s found that not only did this model show high risks of increased health care costs, but also that it often leads to worse health outcomes for the population,” said Deber. Roy Romanow, in his famous Report on the Future of Health Care in Canada cited Deber’s work on the distribution of health care expenditures and MSA’s, and the province of Alberta, which had been on the verge of implementing this model, decided against the change. Deber’s contributions to public life can also be seen in her work as a teacher and faculty member with the Institute of Health Policy, Management and Evaluation. 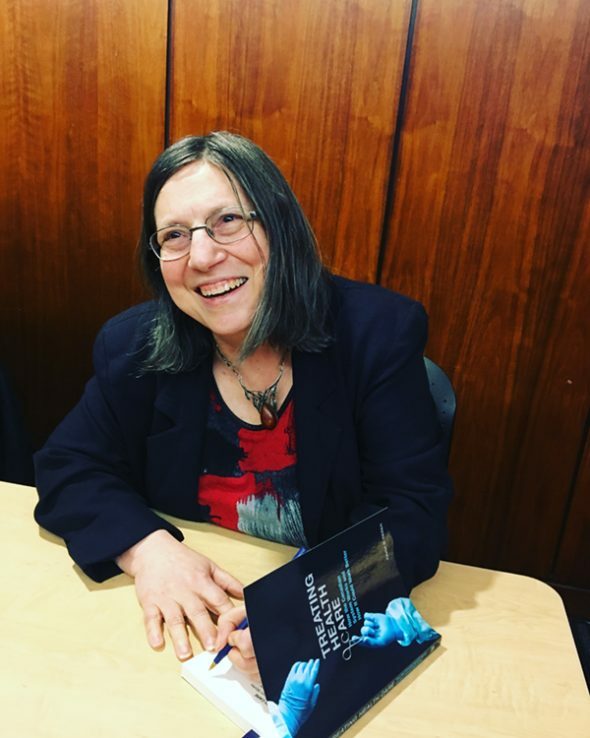 “A lot of IHPME students are career professionals and when I first began teaching, many of them were older than I was, but I never assumed that as “professor” I knew everything,” she said. One example is her edited volume, Case Studies in Canadian Health Policy and Management, which was written with about 130 students who had taken her case studies course. Continuing to work with her students, including teaching and thesis supervision, is what currently keeps Deber busy, alongside her work with colleagues at the Institute. She recently published a book on the Canadian health system Treating Health Care: How the Canadian System Works and How it Could Work Better, with U of T Press, which has been described as an accessible guide for all Canadians to unpack the key concepts that define their health system. On the horizon for Deber is her ongoing work with Professors Whitney Berta and Audrey Laporte on health human resources and her contributions to Professor Greg Marchildon’s new book series on health system profiles across the country. Deber joins two other faculty members, Patricia O’Campo and Prabhat Jha within the Dalla Lana School of Public Health, as newly named Fellows, and all will be welcomed into the Royal Society of Canada at the Celebration of Excellence and Engagement in Halifax this November.